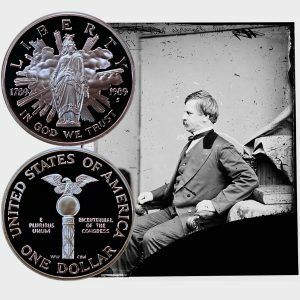 Today, the Congress Commemorative Silver Dollar Coin remembers the end of the nine-week ordeal to choose a speaker for the House of Representatives on February 2, 1856. The protracted struggle for the speakership was brought to a close last evening by the election of Hon. N. P. Banks. Nine full weeks were consumed before this result was attained, and it was finally brought about by the adoption of the plurality rule. Although it is absolutely certain that there is a majority of the representatives in the House who agree with Mr. Banks on the sectional questions which now agitate the country, yet it has been demonstrated, again and again, that a portion of his own political friends would never agree to vote for him for Speaker, and hence that he could never be elected by a majority vote. As we have remarked, the contest was finally terminated under the operation of the plurality rule. The votes taken during several days past had indicated that a Speaker could only be chosen by resorting to that rule. There was a strong repugnance amongst the national members to its adoption, more especially after the revolting declaration of Mr. Banks as to the test of superiority in the races. The southern Know Nothings manifested a determination against casting their votes for the democratic nominees not less persistent than their refusal to vote for Mr. Hanks. On Friday, however, propositions were made by Democrats to which the southern Know Nothings indicated a disposition to accede — the one proposing Mr. Oliver, an old-line Whig, and the other Mr. Aiken, a National Democrat, for Speaker. The votes on these propositions, compared with that given on the same day on a resolution declaring Mr. Banks the Speaker, showed so little difference that it was exceedingly doubtful what would be the result upon the adoption of the plurality rule. At this point Mr. Smith, of Tennessee, believing that the chances of Mr. Aiken were at least equal to those of Mr. Banks, brought forward a resolution for the plurality rule. Mr. Orr immediately withdrew unconditionally his name as the democratic nominee, and the resolution was adopted. The result was, as we have stated, the election of Mr. Banks by a plurality of three votes — Mr. Banks receiving 103 votes, and Mr. Aiken 100 — six national Americans throwing their votes on Mr. Fuller, and four Republicans throwing theirs on Mr. L. D. Campbell. It is apparent that a perfect union of the national members (the four Republicans voting for Mr. Campbell) would have elected Mr. Aiken by a plurality of three. Thus has ended the most extraordinary struggle that has ever occurred. Although the result is one which every national man will regret, yet, as the Republicans have a known majority in the House, and therefore were entitled to the Speaker, there is reason for acquiescing, inasmuch as it enables the machinery of government once more to move on. The House met at 12, m.
Prayer by the Rev. Mr. Cummins. The journal of yesterday was read and approved. Resolved, That the Hon. Alexander H. Stephens be, and he is hereby declared Speaker of the House of Representatives for the 34th Congress. Mr. Talbott had offered the resolution without having any conference with the honorable gentleman whose name was contained in it. He had hoped that it would reconcile all the discordant elements of the House, and bring about an organization. He rose for the purpose of withdrawing the resolution at the request of the gentleman from Georgia. Resolved, That the House will proceed immediately to the election of a Speaker viva voce; and if, after the roll shall have been called three times, no member shall have received a majority of the whole number of votes, the roll shall again be called, and the member who shall then receive the largest number of votes, provided it be a majority of a quorum, shall be duly declared Speaker of the House of Representatives of the Thirty-fourth Congress. Mr. Goode, of Virginia, moved to lay the resolution on the table; which motion was not agreed to — yeas 104, nays 114. The previous question was seconded, and the main question was ordered to be now put. Mr. Orr, of South Carolina, said that his name had been put in nomination some two weeks ago by the Democratic party for the speakership, and though very many ballots had taken place since that time, and although the members of that party supposed that by changing their nominee they might increase and strengthen them, yet the result had shown that they were mistaken in the conclusion to which they arrived. The complimentary vote given yesterday to his colleague [Mr. Aiken] rendered it very evident to his mind that that gentleman would be able to concentrate a greater strength than himself, and as he desired to see the House organized upon national principles, and in opposition to sectionalism, he took occasion, after returning his thanks to his party friends for their fidelity and confidence in nominating and sustaining him, to withdraw unconditionally his name from the contest. Mr. Boyce, of South Carolina, moved to rescind the resolution just adopted. Mr. Walker, of Alabama, moved to rescind the plurality resolution. Mr. Clingman raised the point that the motion was not in order, it having been decided once already during the day. The Clerk thought that the motion was in order, but submitted the question to the House, and it was decided that it was not in order — yeas 83, nays 128. Mr. Paine, of North Carolina, moved that the House do now adjourn; which motion was not agreed to. The House then proceeded to vote for Speaker, it being the first under the plurality rule. Mr. Richardson, of Illinois, gave notice that he had paired off with Mr. Emrie, otherwise he would have voted for Mr. Aiken. So there was no choice. Mr. Rust, of Arkansas, moved that the House do now adjourn; which motion was not agreed to — yeas 52, nays 162. Mr. Fuller, of Pennsylvania, desired to repeat what he had said upon two former occasions, that he was not, and did not desire to be, a candidate. [Applause.] One hundred and thirty ballots would have satisfied him that he was not the choice of a majority of the body, and upon no other terms, upon no other conditions, would he consent to take that position. He again returned his acknowledgments to the gentlemen who had honored him with their support, and he requested them to cast their suffrages for a better and abler man. During the call of the roll on the last ballot the following explanations were made. Mr. Barclay, of Pennsylvania, said that his votes stood on the record, and he saw no reason why he should change them. He had been adverse, from the first to the last, to anything that looked like a coalition with know nothingism, he did not care whether it came from the North or the South. He had on three votes this morning cast his votes away, and before he again cast a vote he wished to ask the gentleman from South Carolina [Mr. Aiken] whether he had written a letter to the honorable gentleman from Kentucky [Mr. H. Marshall], and whether he had made any pledges satisfactory to the Southern wing of the National American party? Mr. Rust objected to the gentleman proceeding further. Mr. A. K. Marshall, of Kentucky, said that he and those with whom he acted had discharged their duty to their party, and it now remained for them to discharge it to their country. He voted for Aiken. Several other gentlemen made explanations before voting for Aiken. Mr. Benson, of Maine, one of the tellers, announced that Nathaniel P. Banks, Jr., of Massachusetts, was duly elected Speaker. Mr. A. K. Marshall raised the question that the House itself must declare the result, and that the Clerk could neither do so himself nor delegate any one to do so. He should be very sorry to see the Clerk depart from that course which had hitherto secured him so many friends. After some debate on this point, in which Messrs. Rust, Clingman, Cobb, of Georgia, Smith of Alabama, Paine of North Carolina, H. Marshall, Campbell of Ohio, Herbert, and Stewart participated, and during which Mr. Aiken asked permission of the House to conduct the gentleman from Massachusetts [Mr. Banks] to the chair, as the duly elected Speaker of the House. After some debate, the previous question was called on the resolution, and seconded, and ordered to be now put. The question was taken, and the resolution was adopted — yeas 156, nays 40. The Clerk appointed Messrs. H. M. Fuller, Aiken, and L. D. Campbell to conduct Mr. Banks to the chair. Mr. Banks, on taking the chair acknowledged the honor done him in a brief and neat speech. The usual oath of office was then administered to him by Mr. Giddings. On motion of Mr. Cobb, of Georgia, the House, at 7 o’clock, adjourned. The Congress Commemorative Silver Dollar Coin shows with an image of the honorable N.P. Banks, Jr. of Massachusetts, circa 1860s.